WCC supports the International Council of Chemical Associations’ (ICCA) position that sound chemicals management is best achieved through a combination of transparent, cost-effective, science-based regulation and voluntary initiatives. Industry led efforts – such as Responsible Care® and the Global Product Strategy – can be effective in helping achieve sustainable development at the global and local levels, and the institutional framework should help facilitate and encourage such initiatives. It should also help build capacity and develop institutions that support implementation at the national level. The Strategic Approach to International Chemicals Management (SAICM – www.saicm.org) provides an innovative model of how multi-stakeholder frameworks can help advance sustainable development objectives. Similarly, private-public partnerships can supplement intergovernmental activities and act as a catalyst for improved implementation. The chlor-alkali industry’s dedication to continuous social, economic and environmental improvement remains undimmed. Efforts continue at local, regional and global levels, coupled with open and timely dialogue with all stakeholders, including regulators, elected officials, scientists, the media, investors and employees. Sharing best practices for optimizing safety and minimizing emissions remains a top priority as we move towards our long-term vision of achieving zero accidental releases, and zero transportation and customer safety incidents. The next event will take place on 23-24 July 2019 in Johannesburg, South Africa. This event will take place along side the African Water Forum on 24-25 July 2019.
organic pollutants (POPs) and wastes. As an example, WCC is a partner in the U.N. Environment Program (UNEP) Mercury Partnership. 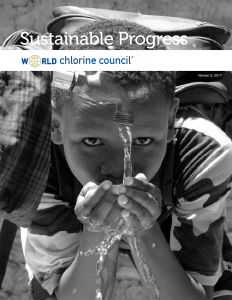 Our commitments to phase out mercury-based chlor-alkali production, under the Global Instrument on Mercury currently under negotiation, illustrates that WCC continues to be an active traveler in this global journey towards sustainability.